Park Origin Phayathai is a freehold luxurious condominium in the heart of Bangkok. It is part of a Mixed-Use Complex, along with One Phayathai, a 25-storey commercial building inclusive of five-star hotel, Grade A office, retail, dining and a supermarket. Park Origin Phayathai is a freehold luxurious condominium in the heart of Bangkok. 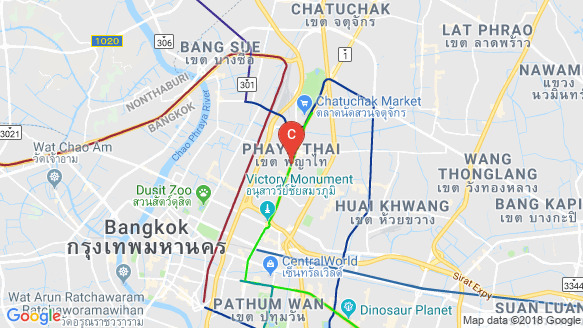 It is part of a Mixed-Use Complex, along with One Phayathai, a 25-storey commercial building inclusive of five-star hotel, Grade A office, retail, dining and a supermarket. Developed by Origin, a leading Thai developer, and managed by World Renowned 5-Star hotel group, Park Origin Phayathai is set to be an iconic 35-storey high-rise luxurious development in Phayathai. It is located 200 meters to Phayathai BTS and Airport Rail Link, making it very convenient to get to Suvarnabhumi Airport in 25 minutes. It is also located just 2 stops from Siam BTS Interchange. Designed by renowned Singapore Architect Ong & Ong Design Co, Ltd, an iconic feature of the building is the 35-storey high hiking track where residents can challenge themselves by climbing all the way from level 1 up to the top. It is also a next generation smart home equipped with home automation system such as lightings control, curtains control, temperature control, air-conditioning and a smart mirror where users can play music, videos or even make a phone call in the bathroom. Park Origin Phayathai is an excellent property for investment as well as for own stay.